It’s the end of the first week in the Crossfit Quantum Spring Leaning Challenge! Only 23 more days until the end of the 30 day induction period. This weekend was a struggle for me because we had dinner at my mother-in-law’s which included wine, fresh bread, mashed potatoes, broccoli casserole and a plethora of her AMAZING homemade desserts: Chocolate cake, brownies, pumpkin pie and cheesecake. Normally I always indulge because it’s sooooo good and we only have these dinners every few months. But this time, I did not eat any of these things! I’m not going to lie, it was so hard and I felt like clawing my eye’s out. But I have to admit that I enjoyed not being in a food coma afterwards. Bless my amazing Mom-in-law because she went out of her way to make roasted veggies and a beautiful fruit salad especially for us. We then attended a friend’s b-day party where I slyly sipped on soda water pretending it was vodka & soda – a friend then questioned my drink choice, insinuating that I was pregnant! I had to explain the challenge. Too funny. 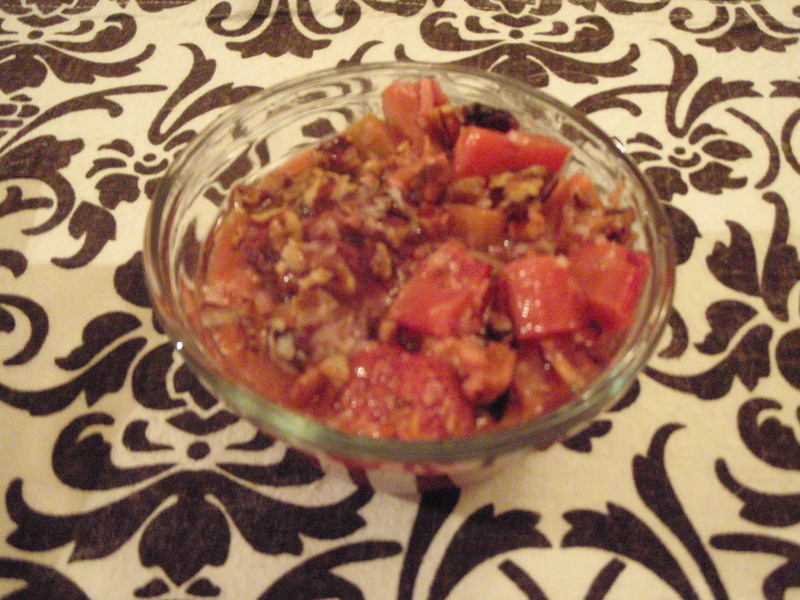 In order to satisfy my craving for something sweet, I made this strawberry-rhubarb crisp. You can find fresh rhubarb at your grocery store now as it’s coming back into season. This is delicious and worked to ease the cravings. In a baking dish (about 9 x 9), spread out strawberries and rhubarb. Mix in the lemon juice and zest. In a bowl, melt the coconut oil. Mix the pecans and coconut with the melted oil. Summer! Thanks for the recipe. Though I am not officially part of the challenge I have been following along. Its easier for KC and I actually have noticed a difference. The sugar craving are the worst part of this. I tried the banana thing and I did not like the cocoa nibs. The bananas and hazelnut butter alone are good though. But the sugar craving did not go. So I will try this. I have rhubarb in my back yard. I will let you know if it works. I loooove Rhubarb. This is a great recipe, thank you for this. I will have to make this tomorrow. it is baking in the oven as we speak! Summer this was delish and super easy to make! Subbed in orange juice and zest for the lemon and added a bit of ginger and cinnamon to the crust for a bit of spice. mmm…good additions! i’m going to add the cinnamon & ginger next time! I doubled the amount of strawberries and this was absolutely delicious! This is a fabulous rhubarb recipe! I was skeptical because there was no added sugar but the coconut-pecan crust balanced everything out. I can’t wait to make this again. Thanks for sharing!